SymQuest Group, Inc., a wholly-owned subsidiary of Konica Minolta Business Solutions U.S.A., Inc., and regionally based IT services and office technology provider, celebrated their Plattsburgh, NY office grand opening in conjunction with a nonprofit grant campaign: One Grand of a Helping Hand for North Country Nonprofits. 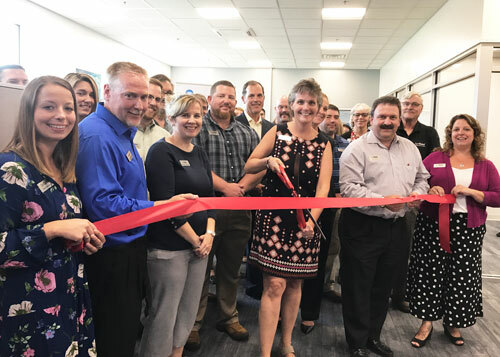 Five nonprofit grants were announced at SymQuest’s July 20th ribbon cutting for its new office located at 18 Northern Ave. STE 200, Plattsburgh, NY. Nonprofit grant recipients included: The Hospice of the North Country, Child Care Coordinating Council, North Country Mission of Hope, ETC Housing Corporation and North Country Center for Independence. Each organization was awarded a $1,000 grant. SymQuest’s new 6,040 Sq. Ft. location supports sales, service, and network operations personnel. The new office also houses a demonstration facility for office technology solutions including multi-function copiers and printers, production and wide format printers, and cloud infrastructure solutions. To learn more about SymQuest’s commitment to the community visit www.SymQuest.com/Community.